Few things are as satisfying as a deliciously warm and perfectly made mug of coffee. The way those first few decadent and caffeinated sips of nectar warm your body is nothing short of intoxicating. Alas, those initial moments are fleeting as the laws of thermodynamics begins to take hold. Your once divine and hot mug of coffee begins to cool at an alarming rate. Before you know it, your next sip is lukewarm and the unforgettable taste of the once glorious brew has dissipated. It is a struggle that every coffee drinker must face. At least, that use to be the case before the creation of the Ember Ceramic Mug. In 2015, a young startup company by the name of Ember had an idea: what if your warm drink of choice did not have to lose heat? This was the premise that spurred the creation of the Ember Ceramic Mug. A mug with built in elements to sustain the desired heat of a drink for a prolonged period of time. 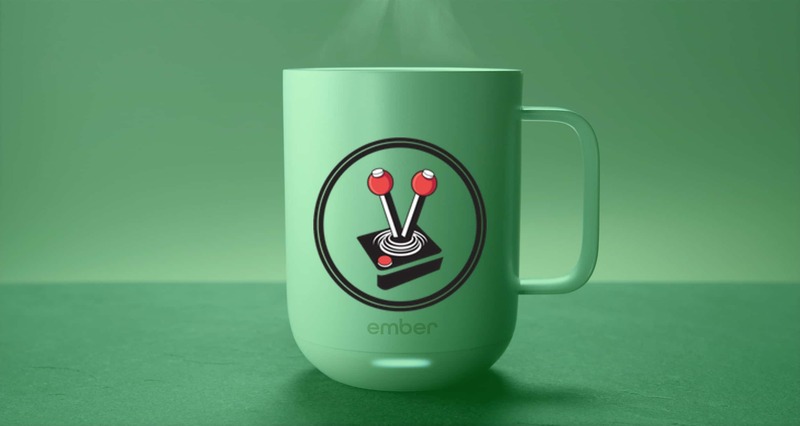 After a highly successful Indigogo campaign, the Ember Ceramic Mug became a reality. The product has been so successful, that even Starbucks in the USA stock the mug for resale. In truth, I was completely unaware of the Ember Ceramic Mug. That is, until I was lucky enough to be gifted one for my most recent birthday. I have been using the mug for a few months now, and it has had a profound effect on the way I consume warm beverages. To say that a mug is beautiful, may seem like an odd statement. Yet that is exactly how I would describe the Ember Ceramic Mug. For all intent and purpose, you would not be remiss for thinking that this mug was designed by Apple. Not only is the design wonderfully minimalist, but the packaging and accompanying accessories are of the same excellent build quality. It is also priced very much like an Apple product, retailing for $80 (over R1000). The Ember Ceramic Mug comes in two colours: white and black. As the name implies, the mug is first and foremost coated in ceramic. This gives it a wonderful matt finish and feel, making the mug easy to hold and grip. The mug also stays surprisingly cool to the touch at all times – regardless of how hot the liquid it carries might be. It also features a decently sized handle for even the bulkiest of fingers. Unfortunately, the gorgeous ceramic coating is also this mug’s biggest flaw: it scratches quite badly if you use metallic implements. Ember make no note of this on any of the packaging materials, which is quite disconcerting. It means that users, like myself, have to find out this unsavoury truth by unintentionally damaging the mug. Given how expensive the mug is, this is a rather unfortunate oversight by the company. The scratches and discolouration are particularly noticeable on the white variant of the mug, making it age far quicker than necessary. The lower sixth of the mug is made of a sturdy plastic that blends in with the rest of the ceramic coating. This houses the mug’s heating elements, status indicator, rechargeable battery, power button and charging connector. Under this plastic piece there is rubber foot that surrounds the mug’s charging coil and an oversized power button. This is also where the copyright and other technical information of the mug are displayed, like the fact that it is IPX7 rated – meaning that is it fully waterproof. It is not, however, dishwasher or microwave safe – a fact that is made quite clear in the packaging materials. I must also mention that the rubber footing has already begun to discolour on the white mug that I own. When the mug is active and warming your drink of choice, users will notice a single light emitting diode (LED) under the Ember name. This status indicator offers users an idea of what state the mug is in (charging, warming, disconnected or connected). The light can be customised in both colour and brightness using the Ember application – a great way to differentiate multiple mugs and their users. The Ember Ceramic Mug also comes with a matching saucer that doubles as the mug’s charging port. Simply put the mug on the saucer, and it will begin to charge. It does not use an inductive charging system, and therefore requires contact between the charging coil on the mug and the node on the saucer. I would have personally preferred an inductive charging method, but this current implementation works well as long as you keep the base dry and wipe away any spills. The Ember Ceramic Mug’s primary purpose is to keep your drink at a desired temperature long enough for you to enjoy it in its entirety. Although the way the mug achieves this is proprietary information, I can attest to the fact that it works as advertised. All while remaining wonderfully cool to the touch. Better still, and this is what impressed me most, is how the mug keeps coffee warm without changing the taste. All coffee drinkers know that coffee tastes its best when freshly brewed. Once a fresh pot of coffee begins to cool, the taste starts to change – a finding backed by science. Reheating said coffee in the microwave or stove is also a science backed taboo, mostly because of how awful it tastes thereafter. Now this is where the Ember Ceramic Mug is worth its weight in gold. I have used this mug multiple times a day for close to two months. The experience has been close to perfect, barring a few issues here and there (more on that later). What has been consistent, however, is how delicious the coffee continues to taste – even an hour after having been poured. From the first sip to the last, the Ember Ceramic Mug does not disappoint. In the past, I would often brew a fresh mug of coffee and then be so consumed with work, that I would forget to drink it. Only to pick it up, minutes later, and sip a dreadful room temperature drink. With the Ember Ceramic Mug, I can continue to sip a perfectly heated brew for up to an hour (without needing to recharge). At first, this may not seem very impressive. However, I noticed a tangible difference in my workflow once I introduced this temperature controlled mug into my lifestyle. 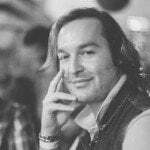 From the happiness that comes from having a near continuous ‘perfect coffee’ at my disposal, through to the convenience of not wasting a half consumed beverage; the experience has, on numerous occasions, left me wondering ‘how did I drink coffee before this’? Another great feature of the mug is that you can manually specify the exact temperature that you would like to enjoy your drink. From a scolding 62 degrees Celsius (the maximum) to a warm 50 degrees Celsius (the lowest set temperature before turning the heater off) there is a setting for all beverage requirements. Courtesy of the mug, I have learnt that I enjoy my cappuccinos at a fairly cool 56 degrees Celsius. Interestingly, your heating preference has a direct impact on battery life. The more the built in heater has to work, the more energy is consumed by the battery. Naturally, it makes the most sense to pour in your beverage at a temperature higher than you would enjoy, and allow it to cool to your preferred temperature. This allows the mug to use its heater to maintain a particular temperature, versus attempting to warm a drink from a colder temperature. 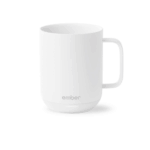 In terms of battery life, the Ember Ceramic Mug can last for around an hour with a constant heat of 56 degrees celsius. When the battery is depleted, it can take up to two hours for one full recharge. The mug can also charge whilst being used, allowing for an almost infinitely warm beverage. Although the mug will work out of the box without any additional tinkering, keeping any fluid it contains at a toasty 59 degrees Celsius, it does function best when paired with the accompanying smartphone application. Available for both Android and iOS, the Ember app allows you to pair your mug to your Bluetooth enabled smartphone. The process is incredibly simple and will have you customising your warm drink to your liking in no time. The user interface is very intuitive and puts the temperature and contents of the mug at the forefront of the user experience. Using visual cues (colour changing background), the software indicates how hot or cold the mug is at any given time and whether or not the mug is empty (when it is, it conserves the battery). It even includes some handy timer settings for tea, as well as presets for a variety of different caffeinated beverages. It also allows users to edit any presets or to add presets of their own. So if you enjoy your Americano at exactly 56.8 degrees celsius, you can easily set a preset to suit your needs. 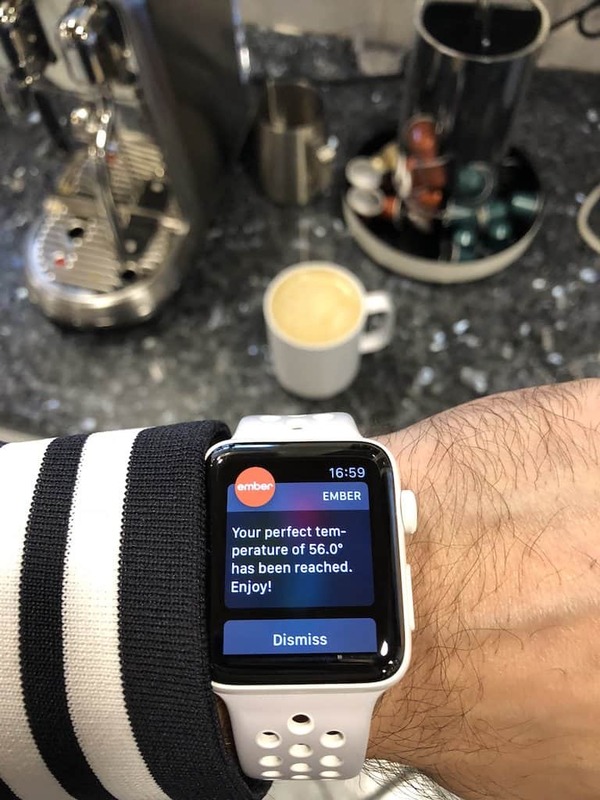 Once the temperature is met or a timer is completed, you will receive a notification via your linked smartphone (or smart watch) and you may begin consuming your beverage. It is all very easy and straightforward. The software also allows users to customise the brightness and colour of the LED on the mug. A wonderful addition for households that have more than one Ember Ceramic Mug. 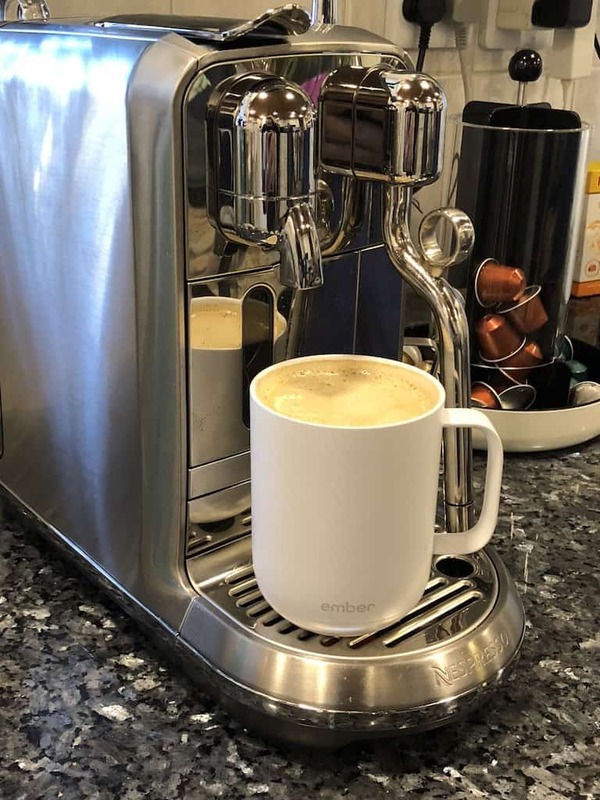 Additional options include temperature gauges in either degrees Celsius or Fahrenheit, options for notifications, as well as the ability to update the software on the mug. Yes, we now live in a world where even a mug can have a software update. For the most part, the software works quite well. With that said, there have been a few rare moments whereby the Bluetooth connection to the mug would fail to activate, thus causing the heater to turnoff. These instances were few and far between in what has been a pretty solid user experience. 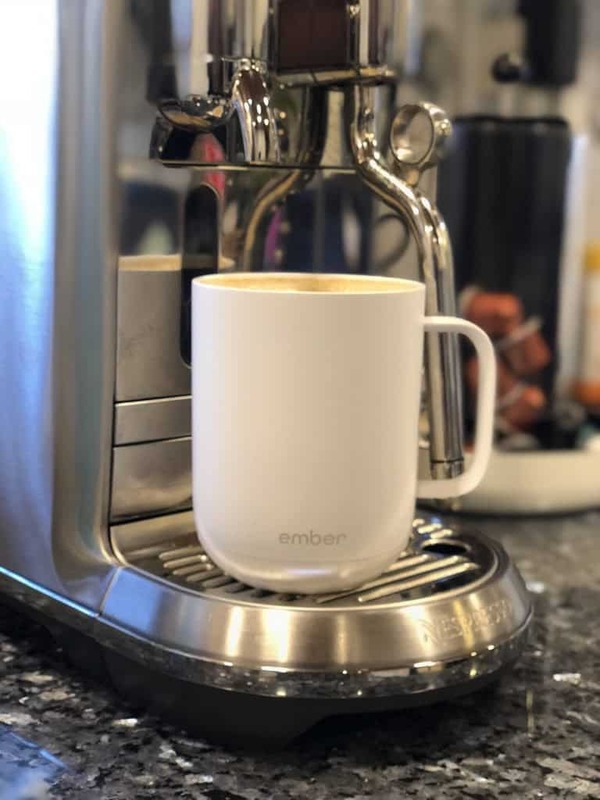 Much like the iPad when it first released, the Ember Ceramic Mug is the kind of device you never knew you needed. It is a device that skirts the edges of frivolity, but becomes immediately indispensable to anyone who has the pleasure of using it. It goes without saying, but the Ember Ceramic Mug has become a necessitous part of my day. It allows me to brew a fresh 300 ml mug of coffee; and then to consume it at my leisure as I go about my daily activities. Gone are the days of being forced to consume my beverage within a certain period of time, or risk my drink turning rancid with disappointment. It is the ultimate technological indulgence for the person who “has it all”, and is worth every penny of the $80 asking price. The Ember Ceramic Mug has become a necessitous part of my day. It allows me to brew a fresh 300 ml mug of coffee; and then to consume it at my leisure as I go about my daily activities. Gone are the days of being forced to consume my beverage within a certain period of time, or risk my drink turning rancid with disappointment. It is the ultimate technological indulgence for the person who "has it all".